Last Friday, I was in the kitchen making cookies again. Nothing out of the ordinary there. If I needed a reason, I'd say it was Friday and the sun was shining and it actually looked as though spring might be here to stay. But we don't need any particular reason to make cookies any/all the time other than simply wanting to make life a little sweeter with a little treat. Cookies are quick and easy to make, and ever so universally beloved. It really is the simple things - and the little things - in life that make it special, and I am grateful for cookies. I love baking them, eating them, and sharing them. Just as cookie-making is a routine, this is not the first peanut butter chocolate chunk cookie I've made. It's a good thing there are so many versions of everything, always a slightly different yet still familiar recipe, to try on our favorite themes. And chocolate chip cookies, peanut butter, cookies in general, are some of my favorite themes. So last Friday, I was filling our cookie jar with the latest batch of cookies - these peanut butter chocolate chunk cookies. I saw them recently and was just waiting for a day to make a batch because, again, favorite themes play on repeat and make us happy. And they did make us happy because these are some solid cookies peanut butter and chocolate cookies. If you share some of my favorite themes then you can imagine that you really can't go wrong with this formula - soft, chewy chocolate chunk cookies full of peanut butter flavor. A mix of dark and semisweet chocolate gives the cookies a little variety and interest. I think they're the kind of cookies meant to come out of your home oven. And I sure hope my oven continues to churn out cookies like these for a long, long time to come. I'm going to say honestly that I have something of a love-hate relationship with these flourless cookies. Despite a few trials with certain flourless cakes and cookies, I still find that I generally don't love them (of course, there are always plenty of exceptions...such as flourless chocolate cake - the kind leavened with eggs - and macaroon cookies, which I do love). Fortunately, I have no need to avoid gluten so I don't purposely seek out gluten-free baked goods. 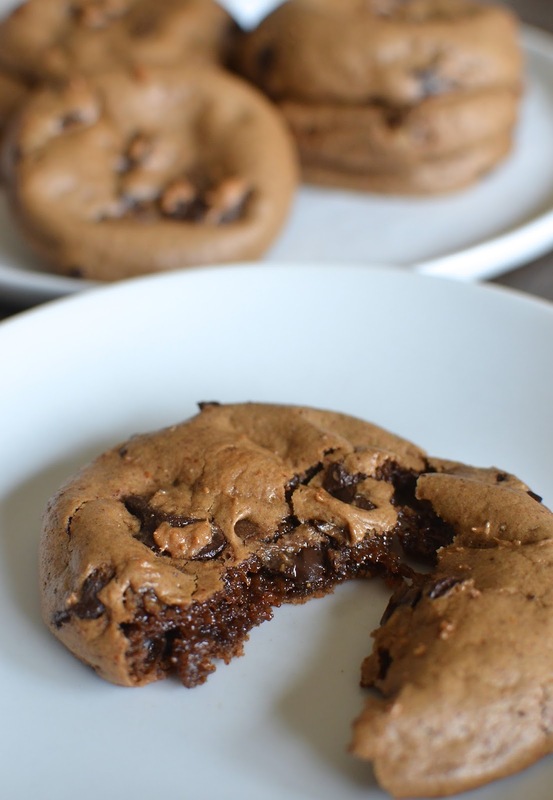 These flourless double chocolate almond butter cookies intrigued me because they looked wonderful and I was happy to have the chance to use almond butter in baking. In the last couple of years, I've come to enjoy almond butter almost as much as peanut butter. Somehow, I think I was expecting conventional, sturdy, cookies to come out of the oven but these are truly the flourless kind - super moist. Just beneath the thin, dry crust that develops on top of these cookies, the center is ultimately fudgy and chewy. And therein lies the love part of the equation. The moist, chewiness - almost brownie-like texture - is something I adore and find addicting. As such, these cookies remind me of energy bars/balls made with dates that I am still trying to figure out whether I like or not. All in, I'm a fan of the chocolaty, salty, rich flavor and the chewy texture of these chocolate almond butter cookies yet I miss the sturdiness of the traditional cookie (clearly, I need to approach it with proper expectations). They may not be my regular cookie of choice but they were certainly a nice change once in a while. Since they are so moist, I find it best to store the cookies in a single layer, in the refrigerator. We actually found we preferred them cold. The fudge factor increases and the cookies were easier to handle/hold. Serving these cookies with a scoop of vanilla ice cream would not be a bad idea. After 7 years of blogging, with plenty of home baking throughout that time, it amazes me that there are always still things I've wanted to make and find myself finally doing for the first time. This time, I'm finally making petit fours (or petits fours, or "fancies", as the Brits call them). Really, they're nothing more complicated than small bites of iced almond cake but made ever more attractive - and, yes, just a bit fancy - by their petite size. I've always been drawn to pretty little things, particularly in pastel colors, and I've always adored these little cakes that look like miniature presents all on their own. I recently made them right before Easter and they are perfect for celebrating spring, or for a wedding or baby shower, a tea party, or, thinking slightly ahead, for Mother's Day. These petite cakes are great for any celebration...including a 7th blogging anniversary! Yes, it's now 7 years since I started this little blog and I have a healthy roster of favorite recipes, and lots of memories and learning, to show for it. I've slowed down the pace of my blogging quite a bit in the last year or so but I am cooking and baking as much - if not more - than ever. It's nice to spend time baking family favorites and to try recipes on a whim without documenting every endeavor. No matter how much or how little I blog here going forward, I hope to be baking and cooking - trying new things and learning along the way - for a long time to come. Now back to the petite cakes. As you might know, I favor small batch baking and as simple a process as possible so that's the approach I took here. After looking and saving many petit four recipes through the years, I settled on a recipe from Martha Stewart that I've had my eye on for a long time. I made a few adjustments by dividing the recipe in half and using apricot preserves as a filling instead of cherry. It starts with a moist almond sponge cake. Once baked in a single layer, the cake is sliced crosswise to be stacked into 2 layers. I filled the center with smooth apricot preserves, reminiscent of one of our favorite things - Italian tri-color (or rainbow) cookies. Some petit four recipes call for frosting. A layer of frosting on top of the cake can provide a smoother surface for the glaze to rest on but I think this version without it is simpler and I like the sharp flavor from the jam filling. These petit fours are coated with a basic glaze of confectioners' sugar and milk. I really like this simple 2-ingredient glaze from Martha Stewart that doesn't require corn syrup, and you can tint it to whatever color you like; I went with white and a pale pink. There's plenty of room for customization in not only the jam filling you use but also the color and design you choose for your glaze. I topped some of the cakes with ready-made sugar flowers. And now because this is me, the resident chocoholic, I could not resist coating some of my petit fours in chocolate! They might not be quite as visually appealing but they sure taste amazing; I used (one of) my favorite 70% dark chocolate and the combination of almond cake, apricot jam, and dark chocolate is, as always, stellar. So here's to great times in the kitchen and at the table! Let's celebrate as often as possible and may there always be some form of cake involved!